The barren desert of China’s southern Tarim Basin has been the source of some of the ancient world’s most mysterious tattooed mummies. Central Asian Caucasoids, tall people with red or blond hair and light eyes, had long been the subject of ancient Chinese legend. Then, in the early 20th century, archeologists digging in the Tarim Basin in western China, unearthed mummies resembling these legendary "gods". At first, no one leapt to any conclusions. The prehistoric graveyard must have marked the final resting place for an unfortunate band of migrants. But more recently, Chinese archeologists working in the Taklamakan Desert, made further discoveries that forced them to reconsider - hundreds more Caucasian mummies, many of them tattooed with geometric designs. They were clothed in garments resembling Celtic plaid, complete with tam-o'-shanters and Robin Hood caps. Perhaps the ancient Chinese legends of how their civilizations were originally started were accurate. Radiocarbon dating established the mummies as living over 4,000 years ago during the height of the Bronze Age, in the 21st century BC. Italian geneticist, Paolo Francalacci, tested the DNA of a few of the mummies and found two of them to be related to modern-day Swedes, Finns, Tuscans, Corsicans, and Sardinians. 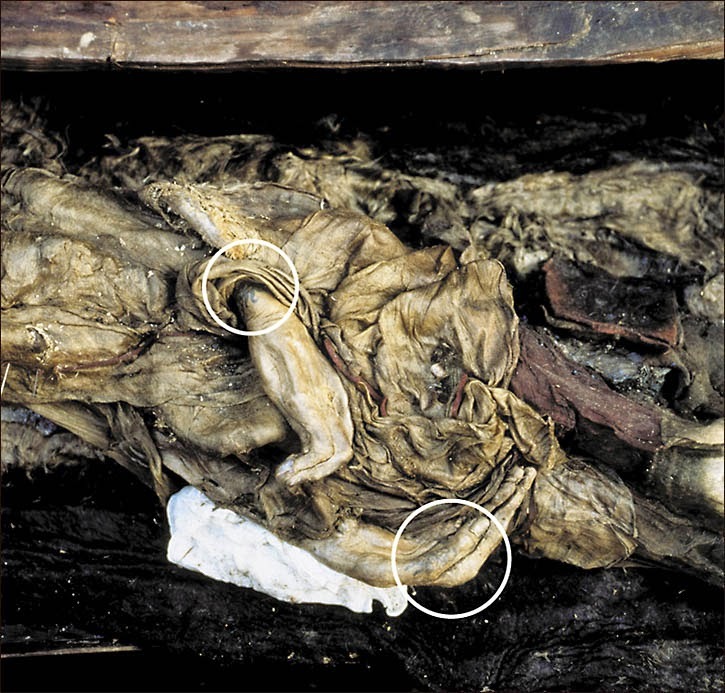 Struck by the similarities between Ötzi the Iceman and these Caucasoid mummies, Sinologist, Victor Mair, remarked, "These guys out in the Tarim (Basin) are just like him - one's in ice and the others are in sand." These were Indo-European people, ancient Aryans, cousins of the Celts and Scythians, a branch of the family that controlled the Silk Road to Europe from 2500 BC to 400 BC. They influenced cultures as far as Japan, spreading their Caucasoid tattoo culture to the ancestors of Japan's indigenous Ainu. If enterprising Caucasians might have once inhabited Xinjiang province, it was a theory that the Chinese government wanted 'classified'. The version of history they guarded was of a Chinese civilization blossoming in isolation, without any Western influence. Consider, too, that the mummies were exotically tattooed - tattooing had been a crime in China for over two centuries. The less said, the better. But not far from the Chinese discoveries, in Russia, on the western edge of the Siberian Plain, dramatic evidence of an ancient tattoo culture was unearthed. And this time, highly publicized. 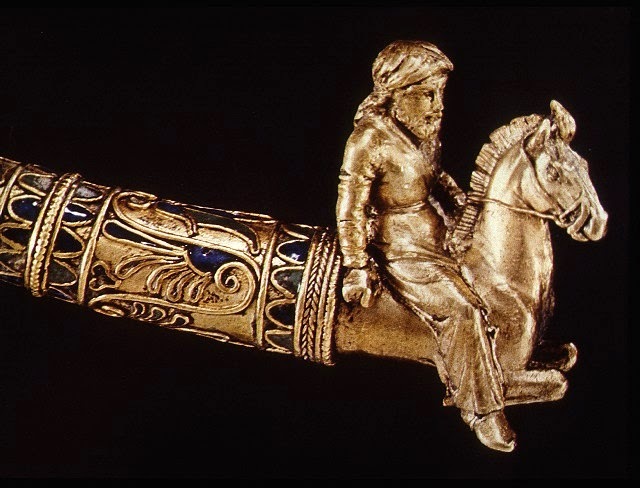 In 450 BC, the Greek writer Herodotus wrote about Scythian nomads to the north, tribes of horsemen who ruled the Eurasian Steppe by horseback, their tattoos acting as 'a mark of nobility, and not to have them was testimony of low birth.' Skeptics assumed Herodotus was dreaming, and held to that opinion for over 2000 years. But in 1948, not far from the border with China, a Russian archeologist named Rudenko discovered an astonishingly well-preserved corpse in a frozen Pazyryk burial mound - and ice-bound Scythian chieftain covered with tattoos of mythical animals. He would have been alive as Herodotus was writing about him. They were formidable Iron Age horsemen and warriors. The artifacts found with the mummies suggest they had an appreciation for art - saddles, rugs, clothing, fine gold jewelry, musical instruments, amulets and tools and fabrics from Persia and China. But the most artistic of all the wonders were the tattoos, an interlocking array of fantastic beasts on the mummy's arms, shoulder, torso, and one leg. When the evidence was made public, much interest focused on a pair of stylized deer and a mountain ram on the chief's right arm. Stylistically, they recalled the art of Persia, Assyria, India, and particularly China. Boldly graphic, this 'animal style' art influenced cultures wherever the Scythians roamed. Over the years, the Pazyryk burial mounds would produce more frozen mummies, but none more exciting than the 'Ice Maiden'. Her white silk dress, elaborate headdress and exotic jewelry were an exciting find, but upon discovering flesh they began peeling back the fabric over her shoulder to reveal dark blue tattoos - once again those familiar mythical creatures. One striking image portrayed a deer's horns morphing into flowers, the muzzle becoming the beak of a bird. The Ice Maiden had more tattoos on her wrist, and one on her thumb. One of her tattoos so closely resembled the chieftain's that it was either drawn from the same stencil, or perhaps by the same artist. This recurring 'deer' motif has puzzled the experts, not least because its convoluted posture with hind legs turned upward suggests an altered state. Signifying what? That those hooves no longer touched this earth, possibly celebrating transcendence or spirituality. The largest burial mound being 100 meters across and containing not only the royal deceased but many of his horses arranged in spoke-like fashion around the central tomb. Alignments of the galleries with stone mounds in the surrounding area strongly implies that this burial structure has astrological and probably ritual relationships. These ancient Aryan horsemen had many rituals, and rites of passage to adulthood were one of them. An examination of the tattooed mummies' subcutaneous fat revealed it to be free of ink, while the deeper layer of muscle was discolored. These tattoos were applied when the person was young, before he put on that layer of fat, later in life. Very interesting. Some of the burial sites also contained cannabis strains. They were know as the Chin. Hence China!